This week the tragic death of one of my all-time favorite comedian/actors, Robin Williams, has had me thinking a lot about depression. There is no one that is immune to slipping into the pit of depression and despair. It is a disease that allows a person to look healthy on the outside while on the inside they spiral deeper and deeper into a state of helpless loss. Depression will sink its claws into the rich elite, the poor, every culture, every ethnicity, every social stature, and every belief if it is given the upper hand. I am no counselor, no psychiatrist, and I am not an ordained minister. What I know of our human psychological and spiritual health has been years of life observation and from studying the Word of God. My role as a nurse has allowed me to care for patients and families in their darkest of times. Many times I actually cared for a person who had attempted suicide while serving my years in a critical care nursing position. Having grown up as a preacher’s kid I saw my father care for the depressed as well as the direct effect that ministering to others had on him. My first- hand experience is the daily battle of temptation to listen to the lies of Satan or chose to listen to God in my own personal life. The conclusive definition of depression as a Christian, mother, wife, and nurse that I have come to is that it is Satan’s lies telling us how worthless we are. The more weight and burdens we carry upon ourselves the deeper we will sink. The more lies of worthlessness the great deceiver can get us to believe the closer he will lead us to an unproductive and destructive life. God created each of us in His image and to have a specific part in His perfect plan. He knows us so well He knows how many hairs are on our head. (Matthew 10:30) Satan wants nothing more than to destroy our purpose, our worth, and to destroy us from the inside out. Christians can often fall victim to depression because Satan already knows he does not have our soul, but if he can make us unproductive in our walk with Jesus he will do so. He does not want our lives to lead others to Christ. The scriptural picture that keeps coming to mind is when Jesus was walking on water. (Matthew 14:22-33) When Peter realized it was Jesus walking toward the boat he was the only disciple who asked Jesus to invite him to come out of the boat and walk to him. Peter took a huge step of faith to walk on storm driven waves to meet Jesus. As long as he looked to Jesus he stayed upon the water. 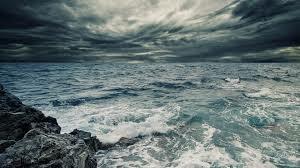 As soon as he started to look at the wind, waves, and realized his personal human weakness he sank. That is the way life is for us. As soon as we start to look at life’s problems, storms, our own sin, sins that have been committed toward us, our chronic illnesses, all the overwhelming tasks, etc… we can easily start to sink into the pit of depression if we try to rely on our own human strength. Satan will lie and tell us that we are worthless, a failure, that everything bad is our fault. The lies are far too many to list. The one thing that God has shown me again and again is that He indeed will turn ashes to beauty. Isaiah 61:1-3 “Spirit of the Sovereign Lord is on me, because the Lord has anointed me to proclaim good news to the poor. He has sent me to bind up the brokenhearted, to proclaim freedom for the captives and release from darkness for the prisoners, to proclaim the year of the Lord’s favor and the day of vengeance of our God, to comfort all who mourn, and provide for those who grieve in Zion—to bestow on them a crown of beauty instead of ashes, the oil of joy instead of mourning, and a garment of praise instead of a spirit of despair. They will be called oaks of righteousness, a planting of the Lord for the display of his splendor.” No matter how overwhelmed I feel in my own weaknesses God always has a surprise waiting. It has been within my own deepest regrets, dark times, and my greatest sadness that God has shown me just how deep His love, grace and beauty runs. My heart aches as I learn of more and more children, teens, and adults that have sunk so deep into the pit of depression that they want to end their own life. We have no idea what lies Satan is burdening others with as we walk through our daily life. God can protect us from this pit if we cry out to Him. God can use our lives to help pull others from the pit of despair. As we focus on Jesus, on loving, serving and encouraging others God will provide the power to walk on top of the stormy waves of this life.